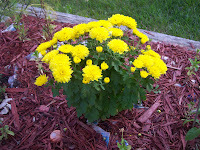 The Thrifty Groove: I have Mums! 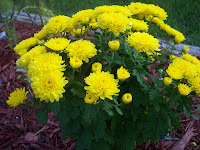 And tomorrow I am linking this post to Bloomin' Tuesday over at Jean's Blog, "Ms. Green Thumb Jean". She is going to be so surprised that I am posting a flower picture! I have only posted pictures of trees over there. So, Shhhhhh...let's just surprise her tomorrow! Okay, on to my Mums! A couple of years ago, the Hubs got some clearanced mums way after the season for some extremely low price. I think he got 5 of them. He planted them in one of our flower beds and we waited to see if they would survive through the winter. Well, last Summer/Fall sadly there were no mums. We were a little bummed but, it was a risk to plant them when we did. And to be honest, I have never had much luck with mums coming back each year. Well lo and behold, this little lady sprouted up a couple of weeks ago and is bloomin' like crazy! I am so excited to see these bright yellow flowers when I really didn't think I would. I actually live 9 hours away from my mom in Windsor. I enjoyed the view and the company. I have some mums that popped our also, pink and purple. oh what a lovely yellow flowers. I love it. wish i can hold them now. Happy MYM. Isn't it wonderful when the lost returns? We make more fuss of that one than we do the many that were there before. Very lovely bright yellow - the color of joy, for sure. The chysanthemums are such a welcomed sight this time of year. Nice mums! The yellow ones are always so bright! I haven't seen a mum I didn't like, have you? Thank you for visiting my blog, Time Stand Still. Oh I want mums! I'm too cheep to get any of the ones I've seen so far! Enjoy yours! What a great suprise and a wonderful sunshiney yellow! How beautiful! I just love mums. I had two big ones that we bought last year, but unfortunately I didn't get them in the ground in time for them to come back. Thanks for stopping by!! Beautiful mums! Love their bright, shiny faces in the fall!